There are lots of things I love about the Coral Cottage...one thing I've loved about it is that I've been able reuse so many things. This is great for at least two reasons--it helps to keep that old charm and character of the original house alive and also--it's free stuff!!! Now of course there's a cost involved in painting and refurbishing but it is less than replacement would be. 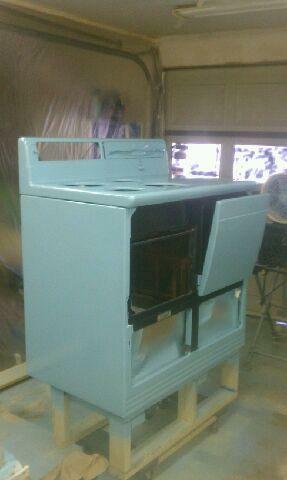 We took the old furniture home and painted it to give it new life. Click here to see my favorite painted piece which was featured in another post. The chrome handles, etc on the range were our biggest problem--we couldn't find a place in Savannah that could re-chrome or polish them. Finally I sent an SOS to my son-in-law's dad, Tommy, who does award-winning restoration of antique cars. Tommy hooked us up with his re-plating company and not only that but he took the parts to the contractor and picked them up as well! Talk about going above and beyond--thanks Tommy!! Pro Plating and Polishing of Suwanee, Georgia came through for us and everything looks great! Want to see? Isn't it gorgeous? 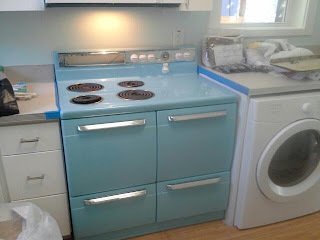 Does anyone know where I could find burner plates to fit an old stove? Now it is time to furnish the kitchen. What do you consider essential in a kitchen when you go to the beach on vacation? Are there certain small appliances that you consider must-haves? Leave a comment below and help me out here friends! As for must-haves on vacation: microwave, coffee maker, can opener (doesn't have to be electric though). Whew! Glad I bought those. I hope a regular Mr. Coffee coffeemaker is ok--I didn't splurge for K-Cups. Yep--those would be essential. Good thinking! The stove turned out so very cute! I would say a Margaritaville blender! It shaves the ice perfect for the margaritas and other frozen drinks and also a wine bottle opener. I've never tried one of those out--sounds awesome! I just re-read my post..wine bottle opener..Ha! that sounded stupid..corkscrew..well more than corkscrew..It is one that has the corkscrew but when you turn it the arms fold up to help pull the cork out..that even sounds more confusing..ha! ok how about a popcorn popper and steak knives. Got the corkscrew and steak knives as you suggested but decided to let folks buy microwave popcorn. Thanks for your input! Coral Cottage looks great! I have to tell you that I have had a sneak peak as I am right around the block from you and happened to be walking by when the house was being worked on! My husband and I love the flooring you chose and would like to know the name and where you got it so we can look into it for our house. If you wouldn't mind sharing that info we would really appreciate it! Leslie, the flooring is Allure vinyl plank flooring in Oak. I bought it at Home Depot. Hope your project goes well! And thanks for reading my blog--hope you'll keep on reading! Thanks,Vicky! I actually found that flooring on HD's website and thought it must be what you used. Amazing how nice it looks. I will definitely be checking in with your blog again. I can't wait to check in on your blog (and in person) to see what happens with the cottage you saved. I LOVE that you kept the tiny cottage and raised it as well. Super cool! We are also working on another raised cottage that I will blog about in a few weeks in addition to the Coral Cottage and the one we are saving. Vicky not sure if you found your stove plates but for sure Cowan & Cowan here in Covington would probably have them. Love what you've done with the stove! Thanks Becky--I will check with them. We bought some that "almost fit" and customized them. When I saw the word free range I thought the post was going to be about free range turkeys or free range chickens. Funny how when we think of free range we think of healthy foods.